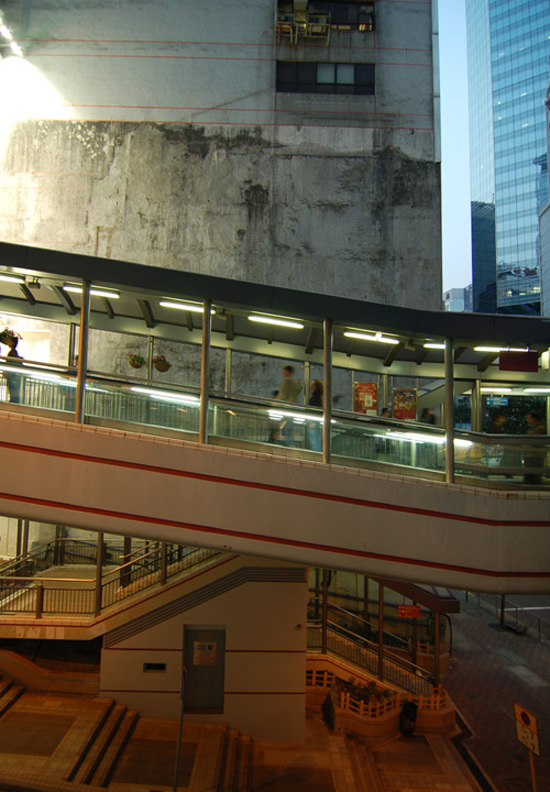 In its March/April 2007 edition, the extraordinary Polar Inertia gives us a tour of Hong Kong's mid-level escalators. 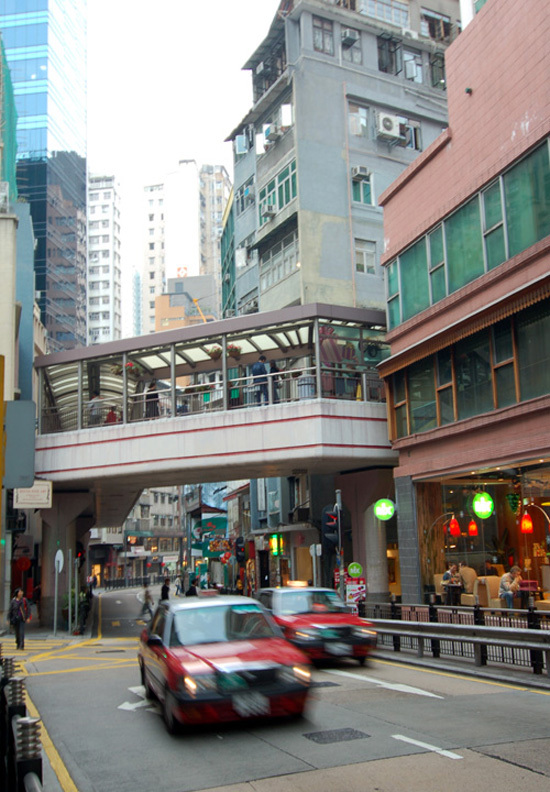 Twisting up through the narrow streets of Hong Kong is the world’s longest escalator system, spanning over 800m. The escalators, moving walkways and pedestrian bridges connect the downtown financial district to the mid-levels, a upscale neighborhood of condominium towers where many executives live. The escalator system was conceived to alleviate car traffic by helping commuters travel efficiently to work while providing protection from rain. The escalators have proven to be very popular, carrying over 45,000 people a day. Somehow we've come to equate pedestrian escalators with airless utopian modernist city where conveyor belts ferret lone figures through an eventless urban landscape. 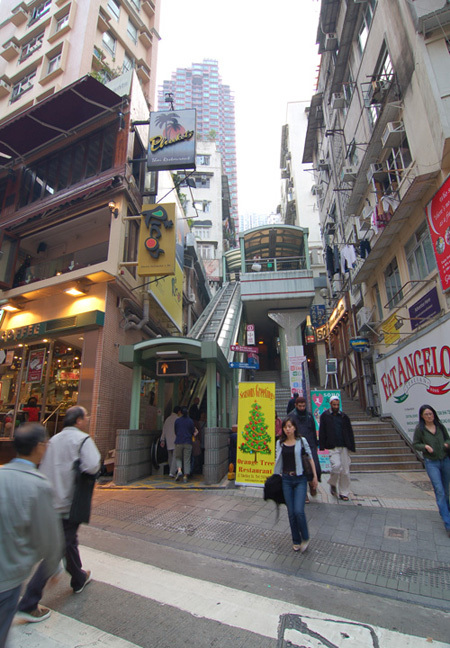 But in Hong Kong, these escalators seem to have fostered quite a robust public space. Since its completion in 1994, the escalators have transformed the neighborhoods they transverse into popular arts and restaurant districts. 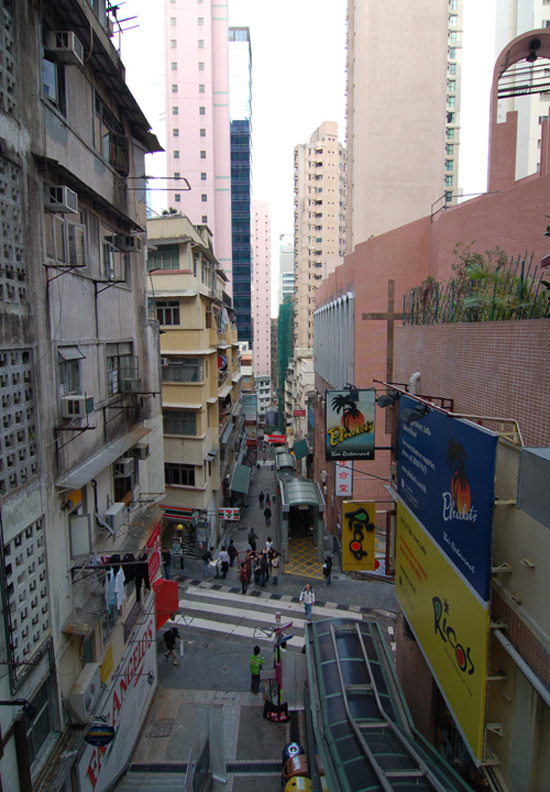 Despite their functional aesthetic the escalators create a unique cross sectional view of the city and have become a place of sight seeing and people watching. With the escalators recent expansion to connect to a series of shopping malls, the ferry terminal and new office buildings it is possible to commute to work, go shopping, visit restaurants and travel back home without ever leaving a covered enclosure. Soon to become very popular with school kids, if not already, who will come in packs, talking on cellphones or texting, playing loud music, sitting on one handrail and their feet on the other, joining other packs, communing in the anti-plaza, flirting, joyriding, fighting, while the city passes by at 2 feet per second. American Graffiti II directed by Wong Kar-wai. Love the hanging potted plants, by the way. This is my favorite escalator in the world, great post. I love Hong Kong's mid-level escalators. They turn the city in to a transitional place - totally appropriate for a city founded upon a transactional trading culture. Very cool, they should build something like this in Downtown L.A. where there are many hills, and it would get people out of their cars.